Simcad Pro generates best, average, and worst case capacity analysis from the Monte Carlo Simulation runs. 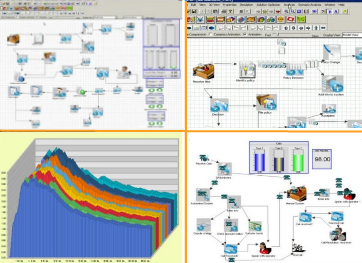 Simcad Pro simulation software integrates all the tools required to run and analyze Monte Carlo simulations quickly and effectively. Coupled with the patented On-the-fly dynamic model updates, Simcad Pro simulation software provides an unprecedented simulation environment unmatched in the industry. Graphing tools to analyze different parameters tracked within the simulation runs are an integral part of Simcad Pro®. All generated data can be exported to other statistical analysis tools if needed.